Riverside Cottage is a high quality, 2 bedroom self-catering holiday cottage nestled on the banks of the river Dryfe in the small, peaceful rural village of Boreland, a few miles north of Lockerbie in Dumfries & Galloway, Southern Scotland. The cottage is available for self-catering holiday lets throughout the year, including short stays of 3 or 4 nights as well as Christmas and New Year breaks. In Lockerbie, south west Scotland …. Riverside Cottage’s location is not only a great base for visiting local attractions in Dumfries & Galloway, cycling, walking, golfing and catching the train for a day in Edinburgh or Glasgow (see a full list of things to do here) but it is also perfect if you just want to relax, unwind and enjoy the peace and quiet of southern Scotland. 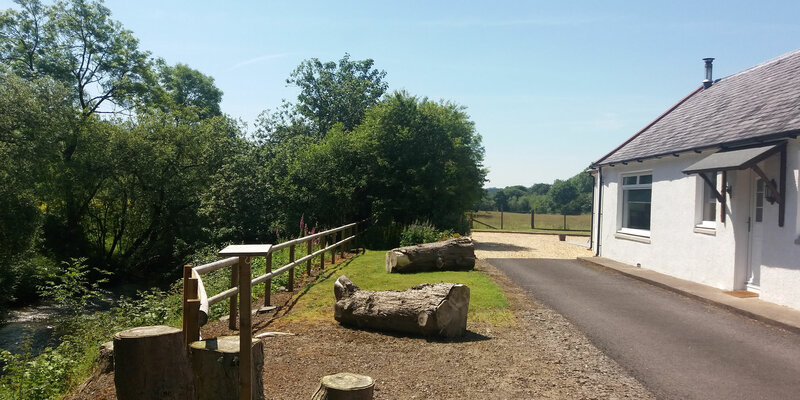 Riverside Cottage is perfect for a family or 2 couples who are looking for that little bit extra, with comfortable self catering accommodation in a quiet, rural location. If you want to get away from the fast pace of life and feel the need to recharge your batteries, plan your trip to Dumfries & Galloway and make Riverside Holiday Cottage your home from home.